Alas it was not to be this time as I am only 2 weeks on from my surgery and under doctors orders to not run. I have done plenty of walking in the past week and decided to just try to walk as much as I can until I get timed out. I had hoped to downgrade to the 50k so to at least have a chance of finishing something but due to all the races being full. 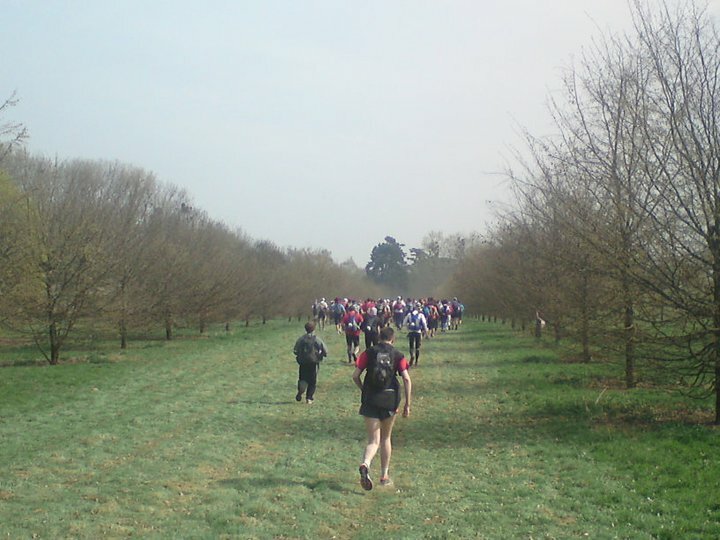 There were nearly 2000 runners in the 80k which would make this the biggest ultra I have done in terms of field. It's not suprising as it is a great race. Here is last years report. I managed to talk a few more Serpies into doing in this year. We all seemed to find each other at the park where the start was. The race does not start till 12.30 which is great for having a lie in but not so good as it starts when it is quite warm and finishes quite late at night. However finishing up the Eiffel Tower in the dark is pretty awesome. Those expecting a good time headed to the front (as it can get quite congested early on) and I stayed in the middle somewhere with Gemma. On the signal to go I realised that I was getting in the way immediately. I was intending to walk until I got timed out and really did not want to run but had to to get out of people's way. I was one of those annoying runners who start unrealistically near the front and then block the way for everyone else. I managed to get to the side and start walking again and watched the mass of runners slowly plod ahead. Within half a mile I was pretty much last bar a few people who had gone off to go to the toilet or faff around with kit. It's quite an odd position, last. It was as if there was a competion for it. This might be the closest I will come to actually ever racing for an extreme position in a race. As I walked along slowly at the back people would look behind then slow down and let me walk past. I am pretty sure they were not the sweepers but just really wanted to be at the back. I carried on with my walking (around 4mph) and was passing a few people who were running. There was a group of about 10 of us who got iscolated at the back while the masses pushed on. There were lots of different people defending the rear from enemy fire. There were a few of your classic "plodders" who had a laboured run/shuffle and entered knowing that they were going to be pushing the cut-offs. However there were quite a few younger men who seemed to have a normal run gait but were doing it in slow motion. I could not quite understand why they were not going faster or whether they were going slow deliberately. Reminded me of the slow bicycle race we had at school. You had to be a very good cyclist to win this by going as slowly as possible. I got disqualified for taking a tricycle. Should have known even then what the difference between "tri" and "bi" was. I ended up walking with this little old lady (who was running) and she felt that it should be her task to reassure me that everything was going to be ok. English was not her first language but she said that we have over 3 hours to get to the first checkpoint and that the others had set out too fast and we will catch them. By "others" did she mean everyone else in the entire race apart from us two? Ha ha ha, all those chumps. Well the race did not go on for much longer for me. I arrived at CP1 (21k) in just over 3 hours and decided to call it a day. My insides were a bit sore and the cuts were rubbing. I'd have liked to leisurely walk about another 13 but the positioning of the checkpoints (the next being 20 miles away) meant that I'd be walking into darkness and would probably take longer to get back to the end. I got on the meat wagon that was just waiting for the final cut-off to take the rest of the runners. It was not great being on the bus going back to the finish obviously but this was a stark reminder that I am far from "ready" to run again. I basically can not tolerate any vertical bouncing. I read all sorts of stories on the hernia op where I was soley focussed on "how long?" Answers ranged from "I was bed-ridden for 3 months" to "I left hospital within the hour, via bungy jump and then sprinted across town to make it in time for my kick-boxing lesson". Still not panicking. Even if I do very little between now and then I am still confident of making it. I arrived back at the Eiffel Tower around 5pm and spent the afternoon with Huw Lobb who had come second in the 50k. Almost as soon as I entered the food tent it started to piss it down quite hard. That would have slowed everyone down. I ate lots of food at the buffet at the end (I figured as I have only done one quarter of the race I was entitled to 4 times the food to make it even). The food at the end was great, with all you can eat meats, cheeses, rice, pasta, salads and cake and all you can drink beer and coke. I was going to be pissed by the time the others finished. I started to stand under the tower just as it was getting dark and some of the leading runners were coming in. It seemed much more spaced out than I imagined with 7.30 on the clock. Gary was the first Serpie home in around 7.45. Rob and Claire (who did not look happy but insisted that was her "happy" face) came in around 8.30. Jen was not much later in just over 9 and I missed Matt and Mark finish. Jen remarked on how her feet felt OK until I sat on one of them with a chair leg. Ouch. We were still waiting for Natalie and Gemma who were within the last 10k now and on the "easy" bit along the river. Gemma's texts would say she's got X far to go and then later say she had longer to go. She sounded like she was suffering so I went out to try to meet her, just as Natalie came in. After around a mile I saw her coming down one of the ramps onto the river and was hobbling quite badly. She had sore feet and blisters and was moving quite slowly, my leisurly walk seemed like great speed. It looked touch and go as to whether we'll make it to the end but in the end there was 15 minutes to spare, she got up the tower easy and claimed her finish. Back off to the food tent (my 5th visit I think). It was great to meet Ian Corless who finished in a great sub 9 time too. I went to get Gemma's bag just after the cut-off was reached and saw some runners head up the steps to the base of the Eiffel Tower to see that it was completely closed. The once flashing beacon spreading across the whole of Paris was now almost invisible even stood right next to it. Must have been gutting to go all that way and not even have a finish to go to. Don't know how that compares to getting bounced away at 12.00.01 in Comrades but the tower was closed for business now and it was lights out. Next year, I'll be ready to give this a good smashing. Third time lucky.